The United States is the world's largest consumer of ice cream. Of all the flavors, Vanilla Ice Cream is the most popular. While there are excellent brands of commercial ice cream, if you have kids you will find they enjoy the whole process of pouring the custard into the ice cream machine and watching it churn until you end up with a deliciously rich and creamy smooth ice cream. 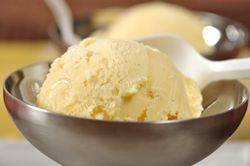 This Vanilla Ice Cream recipe starts with a custard base made with just four ingredients - cream, sugar, egg yolks, and vanilla. The cream gives the ice cream its rich and creamy taste. Sugar is added for sweetness and smoothness and the eggs are necessary for smoothness, richness, and color. Now, since this is 'vanilla' ice cream, vanilla takes center stage. You can use a vanilla bean, pure vanilla extract, or vanilla bean paste. First, if using a vanilla bean it imparts a wonderful complexity of flavors and aromas to the custard. I love how the small dark vanilla seeds dot the ice cream. Vanilla beans are most commonly sold in small plastic cylinders in specialty grocery stores and some health food stores. Look for beans that are shiny and black, tender, plump and moist. Never buy hard, dry and shriveled beans because they are past their prime. The great thing about the vanilla pod, is that once you have removed the seeds and have added them to the custard base. The pod can then be rinsed, dried, and placed in your container of granulated white sugar which in a week or two will give you vanilla flavored sugar. If you decide to use vanilla extract in the ice cream, instead of the vanilla bean, it is important to use "pure" vanilla extract. Imitation vanilla extracts leave a bitter after taste. Products labeled 'Vanilla Flavoring' are a combination of pure vanilla extract and imitation vanilla extract and should not be used. Lastly, you can use Vanilla Bean Paste. It has the convenience of pure vanilla extract but it also contains those wonderful small black vanilla seeds that make the ice cream look so good. It can often be found in specialty food stores or on line. Getting back to the recipe. It is best to make the custard base the night before as it needs time to chill sufficiently so it will freeze in the ice cream machine before the churn gets too warm. The custard should only fill your ice cream machine about half to two thirds full. This is so the custard has enough room to expand while it freezes so you end up with an ice cream with a light texture and no graininess. Usually the ice cream is still quite soft once it has been churned in the machine, so put it into a storage container and place it in the freezer for a few hours before serving. This also allows the flavors to mellow. Although I prefer to eat homemade ice cream the day it is made, it can be stored for a few weeks in the freezer. It will become quite hard after being frozen for any length of time so transfer it to the refrigerator to let it soften. Vanilla Ice Cream: In a small saucepan, over medium-high heat (or in the microwave), bring the half-and-half and the vanilla bean (if using) to the scalding point (the milk just begins to foam up). Remove from heat, take out the vanilla bean and scrape the seeds from the bean with the back of a knife, and mix the seeds back into the half-and-half. Meanwhile in a stainless steel bowl beat the egg yolks and sugar until light and fluffy. You can do this with a wire whisk or a hand mixer. Gradually pour the scalding half-and-half into the whipped egg yolk mixture, making sure you keep whisking constantly so the eggs don't curdle. If any lumps do form, strain the mixture first before heating. Immediately remove the custard from the heat and continue to stir the custard for a few minutes so it does not overcook. At this point stir in the vanilla extract, if using. Cover and let cool to room temperature and then refrigerate the custard until it is cold (several hours but preferably overnight). Transfer the cold custard to the chilled container of your ice cream machine and process according to the manufacturer's instructions. Once made, transfer the ice cream to a chilled container and store in the freezer. If the ice cream becomes too hard place in the refrigerator until softened. Makes about 3 cups. Preparation time 40 minutes.